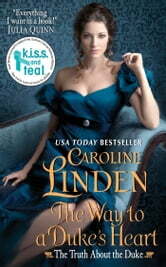 Historical romance readers can’t wait to learn The Truth about the Duke, Caroline Linden’s wonderful series about three English brothers on a quest to restore their family name, seek their fortunes, and find true love. The Way to a Duke’s Heart is the thrilling final chapter, as a charming, pleasure-seeking nobleman takes on the serious business of uncovering a blackmailer, and enlists the help of a beautiful, no-nonsense businesswoman who, against her better judgment, finds herself falling for the rake. A RITA Award-nominated author who, as Julia Quinn says, “touches every emotion,” Caroline Linden once again demonstrates why she is a true fan favorite, especially for those who adore the exciting romantic adventures of Liz Carlyle and Elizabeth Boyle.